Bob Alford (illustrations by Daryl Ford); Kijsaeree Printing Co; Thailand, 2011; soft-cover A4; 92 pages; 89 b+w & colour photos, maps and colour aircraft photos. 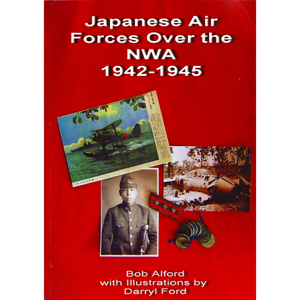 After decades of research into the air war over northern Australia, Bob Alford is arguably the leader in this field and has produced an extremely authoritative book on the Japanese forces involved. These include the naval and army air force units which raided Australia, as well as those units that fought Australian-based Allied bombers over the East Indies in the latter part of the war. Packed with interesting photos and informative colour aircraft profiles, this work fills a major gap in the literature in this area and will be a useful reference source for anyone interested in the northern air war. Perhaps the most unique part of the book is that regarding Japanese aircraft crash sites and remains. Bob was involved in identifying and locating as many of these locations as possible, as well as recovering and studying remaining components. Some of the latter are preserved at the Darwin Aviation Museum. These remains have been studied in amazing detail, in most cases identifying the exact type of aircraft involved and the cause of the crash. In some cases the manufacturer number and / or squadron number of the aircraft has been identified. For model makers and other enthusiasts there is a detailed discussion of aircraft paint schemes based on actual samples. With his background as a RAAF armourer, Bob is well qualified to comment on the effect of tropical conditions of paint schemes and the differing results that inevitably result.